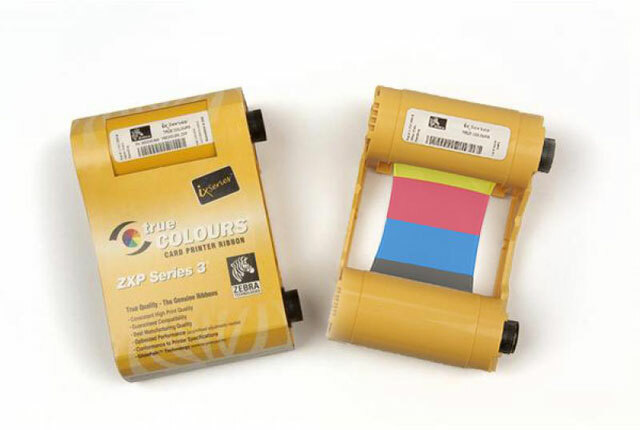 800033-348 ZXP Series 3 Ribbon, ZXP Series 3 IX Series Eco High Capacity YMCKOK Color Ribbon 230 Images/roll. The ribbon is used to print in a variety of colors: yellow (Y), magenta (M), cyan (C), and black (K). The remaining overlay (O) provides an extra layer of protection for the card. The second (K) allows for printing in black on the back side of the card. The ribbon is used to print on both sides of the card. This ribbon is compatible with the ZXP Series 3 Printer. The Zebra 800033-348 is also known as ZCD-800033348 or 800033348	.